Two volumes adorned in the scarce and stunning gold dust jackets. 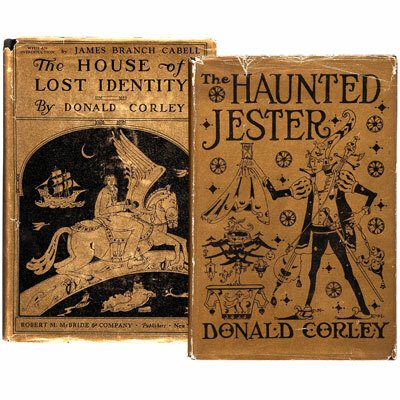 Corley’s tales of mystery and wonder have become celebrated for their spin on traditional fairy-tale motifs, amplifying them with darker, sinister elements... along with occasional comedy. Drawing influences famed myths and legends from Persia, Ireland, China and Greece, both volumes are profusely illustrated throughout with the author’s own Harry Clarke-esque illustrations, and include a foreword by American sci-fi writer, James Branch Cabell. From the library of the infamous Joseph Alexander Sadony, philosopher-scientist, inventor and poet, whose Michigan based ‘Educational Research Laboratories’ at ‘Valley of the Pines’ studied the power of the mind... Provenance: Joseph A. Sadony (1877-1960) with his blind stamp to the title page of Haunted Jester.